A sleight of hand artist and an actress play a strange game in which they manipulate coloured cards at a table with layers like transparent wheels. The game is a conduit for communicating a secret code, a way to both hide and reveal meaning. Cards are shuffled, spread, stacked, thrown, vanished, and mysteriously substituted . Daria Martin’s new short 16mm film, Closeup Gallery completes the trilogy that began with In the Palace (2000) and Birds (2001). Her film offers a flirtatious microcosm of ideas, an intimate drama that both seduces and shatters narrative and obvious conceptual content. It plays with an attitude that lies somewhere between documentary transparency and camp. Emotion emerges through clumsy fumbling and furtive looks, and through mannered falseness. In our contemporary world of digitally mediated fantasy, Martin embraces the anachronism of low-tech special effects. Simple, inexpensive materials and outmoded methods conspire within a world of transformation and fakery. Like a gambler showing his hand, Closeup Gallery reveals its own artifice. 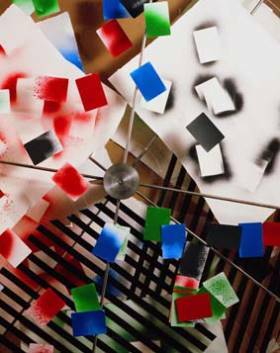 Closeup Gallery interweaves popular cultural references such as1950s melodrama and 1980s graphic design, with distant moments of Modernity - Suprematist painting and Constructivist stage design. The Modernist preoccupation with chance and abstraction intersects with the cool control of music composed on a laptop. Closeup Gallery humorously raises questions of how contemporary art and culture can look and function. As in all of Martin’s work, Closeup Gallery pines for the early Modern, while making promiscuous forays into other moments of more recent cultural history. It asks the question: what could it mean to be ‘Modern’ now? What happens when one forces a historical utopia straight through time and into the corruptible present? Can the fragments be lovingly stitched together and revivified, the scars and seams part of a new beauty?